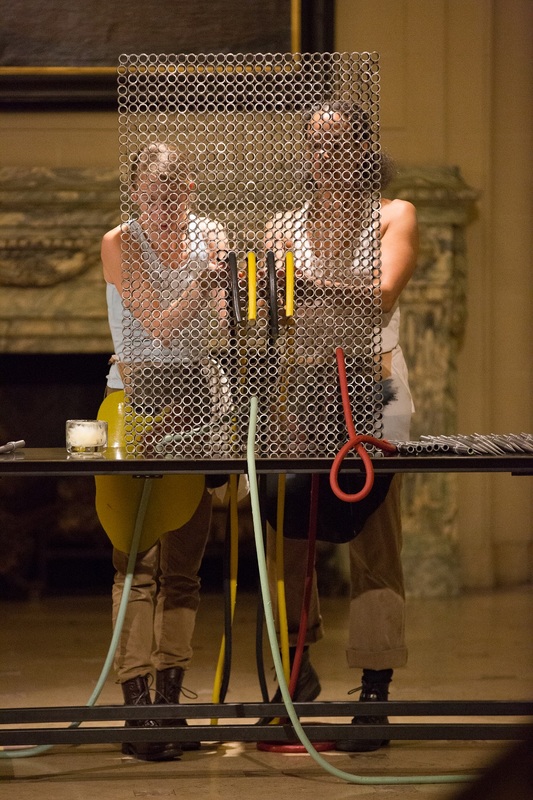 Two Person Operating System activates a new sculpture by artist Martha Friedman, featured in the 2016 Fall Great Hall Exhibition Some Hags. An upright metal grid of cut steel pipe bisects a table, and steel rods — sharpened to a spike — are prepared in rows. During a 30 minute continuous loop, the dancers engage with the grid and each other through a series of methodical tasks performed with workerly precision. The spikes are pushed into the holes, audibly clinking against the metal, and long, fleshy, rubber tubes in various colors are floppily attached to and unleashed from the open pipes. The evolving patterns of action and design explore the tensions between violence and intimacy, work and product, connection and severing, efficiency and waste, soft and hard. Conversation Watch an open conversation held after the world premiere (video below) moderated by Dr. Tina Campt, Professor of Africana and Women’s Gender and Studies at Barnard College, with Dr. Brooke Holmes, Professor of Classics at Princeton University, artist Martha Friedman, and Susan Marshall & Company dancers Kristen Hollinsworth and Luke Miller. Two Person Operating System is made possible by grants from the National Endowment for the Arts, the O.P. and W.E. Edwards Foundation Arts Fund, the Joseph & Joan Cullman Foundation for the Arts, and the Fan Fox and Leslie R. Samuels Foundation. Two Person Operating System received creative and production support from Princeton University’s Lewis Center for the Arts and Princeton University’s Office of the Dean of the Faculty. Additional support for Susan Marshall & Company comes from the New York State Council on the Arts, the New York City Department of Cultural Affairs, Stuart Coleman and Meryl Rosofsky, Betsy and Richard Langberg, The Haje Foundation, Marshall and Beverly Jones, the Harkness Foundation for Dance, the Mertz-Gilmore Foundation, Virginia and Timothy Millhiser, the Bossak/Heilbron Charitable Foundation, Martha Sherman, David Farer and Elisa King, Elissa and Matthew Bernstein, Sam Greenfield, Paul O’Neil and Elizabeth Young, Daniel Baldini, Bea Bogorad and Randy Richman, Robert Dorf, Hank McNeil, Richard and Jane Mescon, Charles Werner, Stuart Morden & JoAnn Grossman, Jerry Bernstein, Edward Henry & Susan Monk, Neal & Francine Kaufman, Cynthia Mayeda, Marilyn Sobel and Peter Krasz, Jack and Bill, Elizabeth Frankel, Martin Marciano, Amy Moore, Constance and Jonathan W. Old, Joe Richards, Aynsley Vandenbroucke, Nina Winthrop, and Diana Wright, among many others. Martha was born in Detroit, MI and lives and works in Greenpoint, Brooklyn. She earned her BFA from the School of the Art Institute of Chicago in 1998 and her MFA from Yale University School of Art in 2003. She has had solo exhibitions at Wallspace, New York (2012, 2009, 2007); the Museum of Contemporary Art Detroit, MI (2010); DeCordova Museum and Sculpture Park, Lincoln, MA (2010); Shane Campbell Gallery, Chicago, IL (2010). Her work has been shown in numerous group exhibitions, nationally and internationally. Select examples include Frieze New York Sculpture Park, curated by Tom Eccles, New York (2013) and Museum on the Seam, Jerusalem, Israel (2013). Friedman is Assistant Professor of Sculpture at Princeton University. Friedman has an upcoming solo exhibition at the Henry Museum in 2018.